For many Italians, indulging in regional dishes on holiday it is a must during the Christmas holidays. Discovering the various specialities at the table is discovering traditional dishes inside a fantastic seasonal menus. Let’s start this simple yet intriguing culinary journey inside the heart of Italian celebration for winter. Typical Italian Christmas dishes are simple food such as baccalà (salted dried cod fish), baked pasta such as lasagne, capon or turkey. Traditional Christmas Eve Dinner, prescribes fish during La Vigilia in southern towns. You need to eat Christmas Broccoli, fried eel and “caponata di pesce” (a sort of fish salad) as main course. 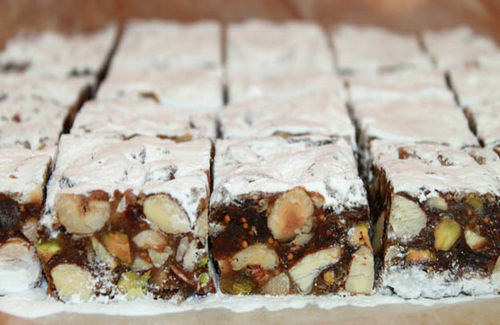 Traditional desserts are also importantfor the Menù di Natale (Christmas menu). Many of them were born in….convents: believe it or not the nuns made special types of dessert and pudding to celebrate major religious holidays such as Christmas. Those were gifts to prelates and to the noble families from which their mothers superior came. These desserts are for example the struffoli (Neapolitan honey pastry), dried figs, candied almonds, chestnuts, and marzipan desserts. Lovely are indeed also the sweet breads such as panforte coming from Siena, the pandolce coming from Genoa, and panettone, the famous and Milanese Christmas bread. How was the first panettone made? The legend tells us that panettone was born in the sixteenth century from a baker named Antonio, who fell in love with a princess. He baked a gold-like, butter and egg bread to conquer her heart. In the nineteenth century, the bread was enriched with candied red cherries and green citron, in order to suggest the Italian flag. And for New Year’s Day and the Feast of the Epiphany? Again we have special meals: on New Year’s Eve there is the feast of San Silvestro, and to complete the culinary largesse is La Befana Dinner, or Feast of the Epiphany. This entry was posted on Friday, December 28th, 2012 at 12:35 am	and is filed under Italian Recipes and Food. You can follow any responses to this entry through the RSS 2.0 feed. You can leave a response, or trackback from your own site.